The Los Angeles Auto Show has given us yet again a glimpse of what the future has in store without neglecting the present. Ford, BMW and Honda stood out for me. Three companies from three different continents have consistently shown a willingness to survive, a hunger to regain their niche market with what made them so unique and regularly better their products year after year. Although other carmakers offer great cars and products, sometimes the overall view and message gets garbled in marketing campaigns that leave with you with more questions than answers. Ford, BMW and Honda have been consistently raising the bar to higher and higher levels and I’m willing to bet, they will be the solid three at the top of the heap for this coming decade and more. Ford, Power of Choice. How well has Ford delivered on its promise to offer as wide a range of cars meeting the needs of almost anyone globally while offering a wide choice of propulsion systems? The choice ranges from naturally aspirated internal combustion engines to its EcoBoost using modern technology of direct injection, turbo and downsizing for efficiency to hybrid, plug-in hybrid, PHEV and finally pure electric. What can wrong for Ford? Naysayers will point to quality control, but this is something we know Ford is taking care of. BMW. Probably the brighter star coming out of the German forest is BMW. Best known for its great M3 and M5 series, the Teutonic carmaker is more known for its curve hugging cars and seats that must be used the way it intended. But oh my, what results. Italian charisma lovers such as I lament the lack of wow-factor with these clinically perfect performance metallic silver cars. If form follows function, why can’t it also involve some design passion? Ferrari does it, Maserati does it and to some extent so does Alfa Romeo. 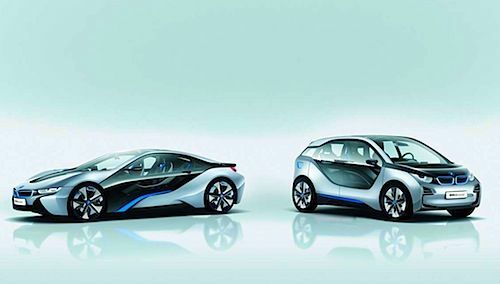 But here comes the i8 and i3 concepts. Here BMW shows a completely different face and majestically marries innovation, revolution, efficiency, performance with a resolutely passionate design. Can you tell yet how BMW will surprise us in the next decades if they continue on this road? Honda. The comeback kid we once knew for its outrageously well-engineered little cars that put the fun back in driving is... back. Engineering is the key word here and Honda is holding true to its philosophy. A quick look of the new Accord Plug-In Hybrid on paper and you can see the company is back at doing what they do best, engineer great cars. My test drive yesterday was nothing more of a revelation. I would actually love to own the Accord PHEV. It handled superbly well, felt comfortable, had enough “luxury” without going of the top but kept everything together into a relevant package. Sport, cruising, performance, comfort and fuel economy. Yes, this is something Honda is working on again. Special Mentions. We should also give special mentions to other carmakers who have been trendsetters but somehow have either been inconsistent with their message or portfolio offerings. Nissan and its Delta Wing for believing and seeing what so many others tossed off as a fluke. Last time I saw a race car as revolutionary as this was the famous Tyrell 6 wheel F1 car. Fiat for its incredible climb out of irrelevancy and showing us an amazing line of 500 that rekindle that je ne sais quoi of a Riviera feel. Of course Tesla Motors and how using common every day batteries can be put to work to deliver spectacular performance, and its Model S styling. Fisker Automotive for showing us luxury and that cocoon-like experience inside a car can marry performance, fuel frugality and styling exercise. In many ways, Fisker is the spiritual heritage of the Maseratis of the 60s. Mazda and Mitsubishi for showing us a piston engine can have performance and reduce gasoline consumption. If you have three auto shows to choose form, the LA, NY and Chicago Auto Show marry quality and truly outside the box thinking over mass-production and vanilla bland commercialization. If the unbridled enthusiasm for electric cars and under the drawer concepts and prototypes of 2008 is absent, the tone is resolutely sober, mature and practical. Watch out for Ford, BMW and Honda to stamp this coming decade and beyond by going back to what made them special in the first place.